What Makes Pilates Unique Among Movement Systems? ANN ARBOR – Elaine Economou shares a glimpse into the movement system she has been teaching for nearly 20 years. The ability to create a fit, vital body for a lifetime, safely and efficiently, is what makes Pilates unique among movement systems. A smiling, brunette woman walks into my Ann Arbor studio on a busy Tuesday. This is Susan. I’ve been seeing her twice a week for the last eight years. She’s now in her mid-70s, and when she first came to me, Susan had some functional challenges. She had scoliosis and a history of surgeries. She no longer had the strength to pull herself out of the pool while playing with her grandchildren and she struggled to walk on the rocky shore of her beloved summer home in Maine. Now, through safe and effective Pilates exercises, Susan can not only climb out of the pool and walk on the beach, but she can also do planks and squats like a pro. Moments like these are frequent in Pilates. Moments of healing, fitness, and growth. Let’s start with what Pilates is not. It’s a unique, anatomy-based system designed by a forward-thinking visionary, Joseph Pilates. What he knew then, research is just catching up to. The goal of a Pilates session is to move through the repertoire of exercises at the level and pace that suits you, moving your spine in all planes of motion and challenging your body with different relationships to gravity. Though challenging, the workout and exercises will energize and invigorate. Before creating Pilates — or what he first called “Contrology” — Joseph Pilates was an avid student of movement. Born in Germany in 1883, Pilates had his own health challenges as a child. Because of this, he was very focused on building his own physical strength. He learned anatomy, wrestling, yoga, martial arts, gymnastics and spent time watching animal movements. He was traveling as a boxing instructor when the World War I broke out, and he was put in an internment camp in the U.K. It was there that he started consistently working with people doing the exercises that became his repertoire of mat exercises. He also found the basis for his spring-based resistance equipment in working with bedridden injured soldiers by tying sheets onto the bed springs for resistance training. Pilates practiced what he preached. He was just as fit in his 80s as he was in his 40s. This idea – that we can accomplish more than we could ever dream of – shaped the Principles of Pilates: Centering, Concentration, Control, Precision, Breath, and Flow. PILATES: AHEAD OF ITS TIME? Mindfulness: In Pilates, we start with the breath because “breathing is the first act of life” as Joe said. It is the foundation on which Pilates builds. Today’s research into optimal health points to the very concepts embedded in Joe’s original philosophy. For instance, evidence supports mindfulness practices — like breathing attentively — to reduce stress and anxiety. Mindfulness can be a powerful tool for depression as well. Dangers of sitting: 72 years ago when Pilates said “civilization impairs physical fitness,” he was foreshadowing a culture that promotes sitting at a desk for eight hours a day, a culture of automation and transportation that has connected our world beautifully, yet contributed to a dangerous sedentary lifestyle. With this in mind, Pilates designed a system to correct posture, alleviate low back pain, and help with injuries that come from physical inactivity. All the muscles! 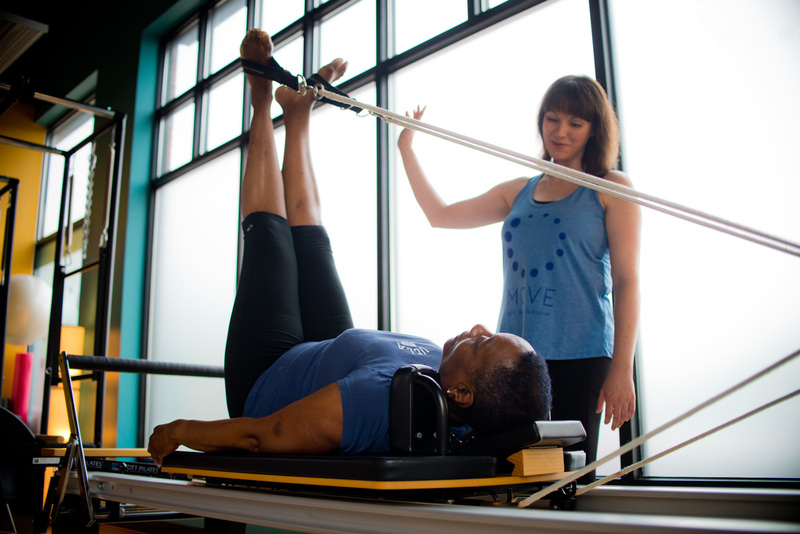 : In my opinion, Pilates is the optimal post-therapy (and maybe even pre-therapy) fitness. Comprehensive anatomy training is required and we understand muscle balance and human movement. We can tell when your tight glute muscles change the way you walk, or when knee pain may start in your back. If you are a runner, for example, I know that hip and trunk mobility and strength can support optimal running form, so I will include exercises that support these in a session. There is emerging research demonstrating that practicing Pilates can positively impact depression and anxiety, low back pain, balance and overall physical conditioning. Pilates sessions happen in “private sessions” or “small group trainings.” A skilled Pilates trainer will create a session using the principles, exercises and equipment tailored to your unique body and goals in private sessions. For example, you might start with some breathing, spinal movement and then a version of the famous Pilates exercise, the Hundred, on the mat. Then you might move to the reformer and use the spring-based resistance pushing with your feet in a series called “footwork” that helps build strength in the legs. Pilates private session on a reformer.